This Saturday I took part in the first Saris Power Training and Coaching certification in the Country. 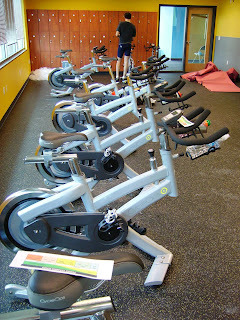 I learned that there are 6 master trainers in the country and 10 coaches. The master trainers are spread throughout the country and will be certifying coaches throughout the nation. At this moment all 10 coaches will be at Zoned 4 Fitness, but soon you will be able to find one at a better health club near you. 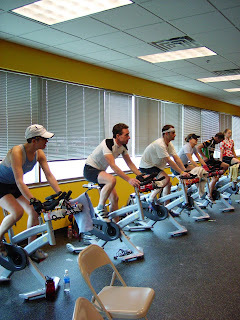 Angie Sturtevant led the training on Saturday, she is the Educational Director at Saris Cycles. Angie will also be moving her business inside Zoned as well, she provides professional performance testing for athletes of all abilities. If you are looking to get exact data on your current fitness be sure to contact her asap. 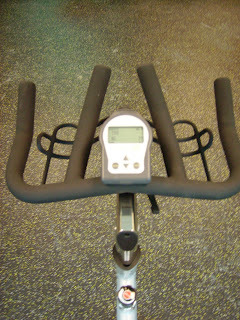 6 Hours class time, 3 hours on the bike. Paul getting another coached dialed in. On the PT 300. Here is me before the suffer fest, no pics after because it was ugly. 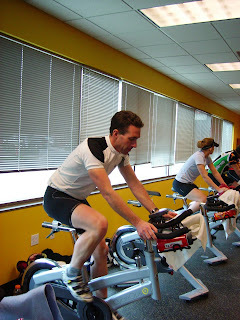 We did a 5 min sustain your highest watts possible test to determine training Zones. I was able to hold 430 watts which wasn't to bad for a first effort. I learned Floyd was holding over 400 for more than 30min the week before. Wow..I want something like that near here. Looks awesome.